Valentine's Day printable puzzle. 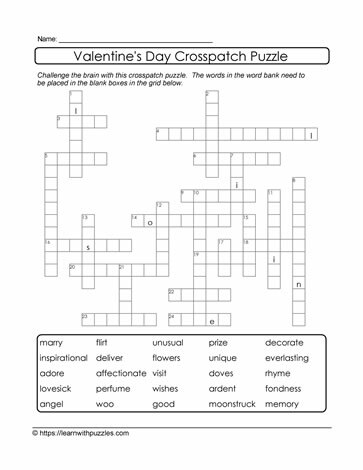 Here is another hint-enabled crosspatch puzzle for use on or about Valentine's Day in all learning environments: Google classroom, regular and home schooling classrooms and the digital classroom. Engage students in elementary 4,5,6 grades classrooms with this brain teaser. Learners fill-in-the-blanks to complete this printable, downloadable puzzle. Use the 25 words appearing below the framework. Engage students' brains to increase vocabulary and activate problem solving skills. Differentiated instruction helps facilitate access for English language learners and students in earlier grades.